In this section of my garage, I have 3 motorcycles. A 1978 Honda CB550K, a 1968 Suzuki T500 Cobra and a 197X Honda CT70. All 3 were given to me, and unfortunately none are currently running. 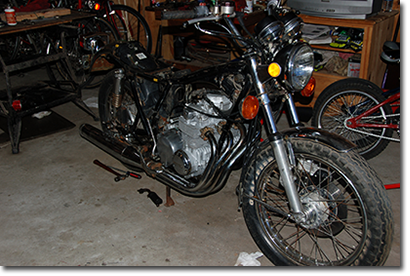 The CB550 was a freebie from someone who got tired of fighting with it, the Suzuki was sitting in a field, and the CT70 did run, but had numerous issues. I've done some work on all of them, but they still need some finishing up to get them on the road.